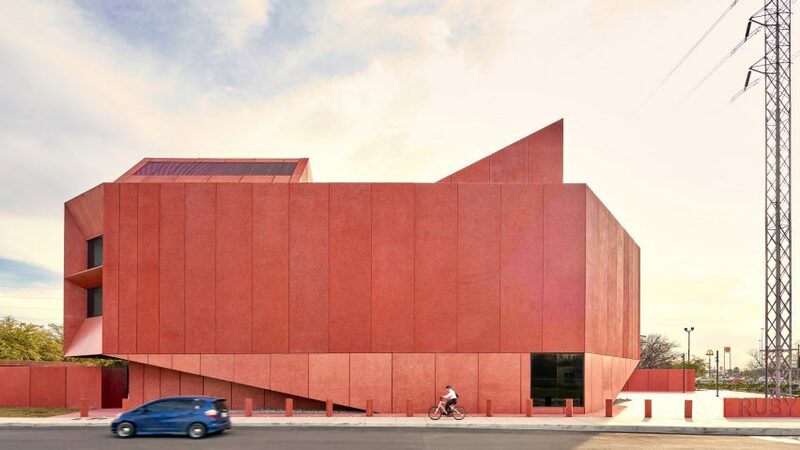 New photos of British architect David Adjaye's contemporary art centre in San Antonio, Texas, show that construction on the angular crimson building has completed. Ruby City is a new art museum in the Texas city designed by Adjaye Associates in collaboration with local firm Alamo Architects. The new photographs, released today, capture the 14,000 square feet (1300-square-metre) as its construction completes. The building is set to open to the public in October 2019. The images show that the faceted exterior is completely clad in the red-toned precast concrete panels that give the building its vibrant hue. A close-up glimpse of these panels captures the aggregate of glass and mica that are intended to shimmer in the light. One of the crimson panels also pops open to reveal a window. Ruby City was first imagined by philanthropist, artist and art collector the late Linda Pace, who passed away on 2 July 2007. The building will be home to the Linda Pace Foundation permanent collection. First unveiled in 2015, Ruby City at 150 Camp Street has a red exterior that architect Adjaye based on the patron's dream. Pace saw a red building in her sleep and made a sketch of it, which she then presented to Adjaye. "My goal was to translate Linda's idea into a building that will do justice to her legacy," said Adjaye in a project statement. "It is a tremendous responsibility, and one that is dear to my heart." "Linda had a clear vision for how the institution should be an inspirational space for the community and interact with its surroundings, drawing visitors into the jewel-like structure while connecting to the San Antonio landscape," the British architect continued. Other details, as shown in the photoset, include glazing that runs along the lower level. Two new interior shots reveal gallery spaces punctured by skylights in the building's jagged roofline. Over 800 works will be presented in these galleries, including pieces by Olafur Eliasson, Thomas Demand, Teresita Fernadez and Antony Gormley. Outside, the centre is accompanied by a grassy area wrapped by an oval pathway. A red cast-in-place concrete wall with a rock salt finish encloses the outdoor space. At the far corner of the garden is a massive structural design by Nancy Rubins, titled Sonny's Airplane Parts. Completing the grounds is a lush park that opened in 2005 to commemorate Pace's late son, Christopher Goldsbury. Ruby City will open to the public later this year, following off-gassing and the installation of art work. Adjaye Associates' construction on Ruby City started in 2017. At the time, the structure's construction was expected to be completed in time for a year of celebrations for the city's 300th birthday, and open to before 2019. Adjaye's firm is responsible for a number of cultural projects in the US, including the National Museum of African American Culture and History in Washington DC and Manhattan's Spy Museum. San Antonio is a large city in south-central Texas. It recently became home to a sculptural outdoor pavilion designed by Lake Flato and Matsys. Photography is by Dror Baldinger courtesy of Ruby City and Adjaye Associates.